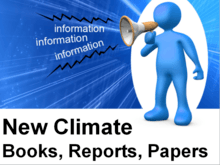 What’s New in Climate Reports? We add hundreds of new books, reports, and journal articles to the Climate Web every year. As Woodrow Wilson said: “There is no idea in our heads that has not been worn shiny by someone else’s brains,” and that’s reflected in the flood of climate-relevant reports. You can see what’s been added to the Climate Web in the last few months on this page, and probably find something of particular interest to you. If publicly available, the PDF will open right there for you to review.